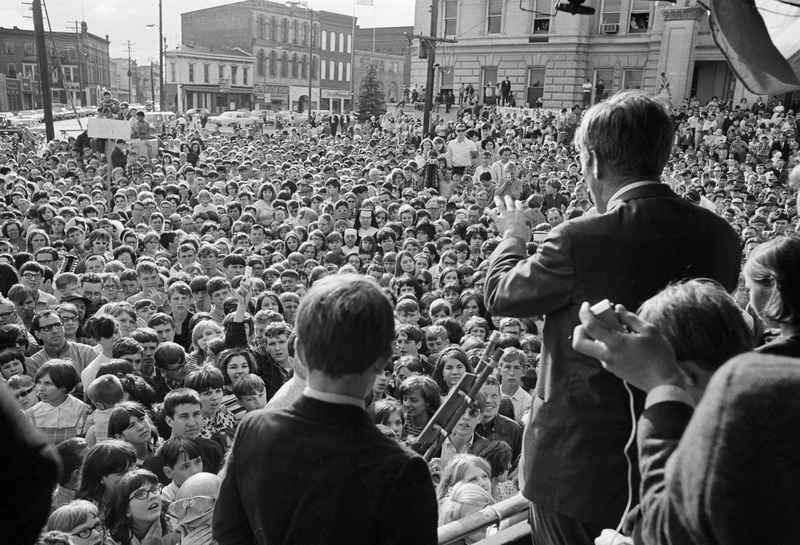 Courtesy Allen County Public Library Community Album Presidential candidate Robert Kennedy campaigns in Wabash in April 1968. With him is son David, 12. The Kennedys toured northern Indiana on the Wabash Cannonball. 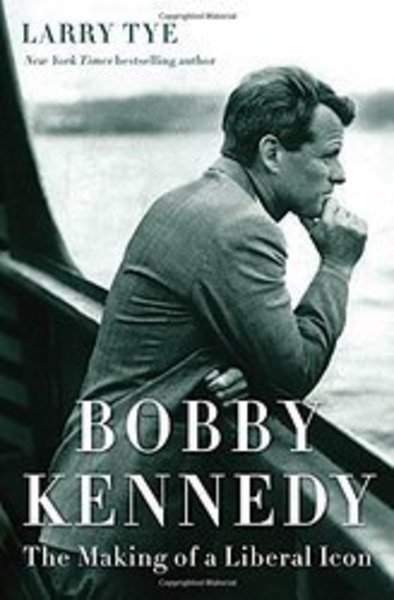 The following is excerpted from Larry Tye’s "Bobby Kennedy: The Making of a Liberal Icon," which will be released Tuesday. Indiana was an unfortunate choice for Robert F. Kennedy’s first Democratic primary test in his crusade for president in 1968. Its politics traditionally was right-wing enough that it once boasted the largest Ku Klux Klan chapter in America, and Eugene Pulliam, who owned both papers in Indianapolis and others in Muncie and Vincennes, hated Democrats, especially Ken-nedys, and above all Bobby, whom his newspaper branded as UNFIT, UNSHORN, UNWANTED. John F. Kennedy lost the state to Richard Nixon by more than two hundred thousand votes in 1960, and George Wallace captured close to 30 percent of the Democratic primary tally in 1964. In his primary, Bobby faced not just Senator Eugene McCarthy, who had spent months organizing there, but also Roger Branigin, the governor, who four years before had won by the largest margin in Indiana history. The question in 1960 had been whether a Kennedy could buy Indiana. In 1968, it was whether Indiana would buy this Kennedy. Bobby seemed oblivious to the challenge at first. In early April he was delivering the same catalog-of-pain speeches he had everywhere else and was buoyed by his huge crowds. But the scenes on the nightly news showed a long-haired, high-voiced candidate being mobbed by fans who were too young and too black for an electorate that was over 90 percent white. Indiana worried more about crime than poverty, and they wanted a father figure, not a fifth Beatle. So Kennedy changed course. By the time he returned to Indiana on April 22 for a pre-primary blitz, his barbers had a green light to crop closer. His schedulers added factories, farm towns, and whistle-stop trains and subtracted universities. He started referring to himself as "former chief law enforcement officer of the United States" instead of "former attorney general," and staffers stopped calling him Bobby, opting for the more grown-up Robert or Bob. His stump speeches focused on crime, hog prices, and his love of Kokomo and other burgs whose names he could barely pronounce or remember. Even his clothes were toned down. Custom-fit suits from Lewis & Thomas Saltz Clothiers were replaced by one that, in the words of a New York Times reporter, "looked as if it had come off the rack of a small-town haberdasher." Mission accomplished. His audiences now were mirroring the Hoosier State’s mid-American electorate, as veteran chronicler Teddy White observed: "The matrons on their porches with their aprons, pin-curlers in hair; the old ladies of Indiana, with their white pinafores over blue dresses, teeter-tottering in tennis shoes to catch a glimpse of him and mothering him from afar. (‘He looks so tired, the poor boy, why do they make him work so hard?’) Blue-collar workingmen thickened the crowds, a rare sight in daytime political campaigning, and one saw them shyly wipe their hands on overalls or shirts before offering hands to the candidate to shake. One grasped for analogy: Along the highway, as the car swept along, he was, obviously, The Kennedy, of the Family and Blood Royal, the Prince Coming to Town. In a working-class district he was Robin Hood. At night, in such places as Gary and South Bend on the final weekend, he was the Prince, Robin Hood and the Pied Piper all combined." Some journalists worried that after tailoring his messages to his galleries, he now sounded more like Barry Goldwater than Bobby Kennedy. There was no denying that he was a politician, not a prelate, but he was far from the prototypical panderer. He made sure that every speech on crime included a call for justice, and that what he said to chambers of commerce differed in the sequence but not the elements from what he said in the slums. Simple evenhandedness was not nearly enough, however. He told college kids everywhere he went that they could change the world, so why the hell weren’t they? He warned eight hundred medical students at Indiana University that they’d have to foot the bill for caring for the poor. As boos rang out, a doctor in training asked whether the senator would end medical students’ cherished draft deferments. "The way things are going here today, probably yes," he said, smiling but serious. It happened again at a luncheon of Civitans, a men’s service club. As his audience chewed on Salisbury steaks, he took the requisite questions on gun control and daylight saving time. Then he turned to his biggest issue – "American children, starving in America" – and asked, "Do you know, there are more rats than people in New York City?" Hearing guffaws, this senator who was kept up nights by images of the hungry children he’d met in the Mississippi Delta grew grim: "Don’t ... laugh." Thomas Congdon, Jr., an editor at The Saturday Evening Post who had started as a Kennedy cynic, was struck by what he witnessed: "He was telling them precisely the opposite of what they wanted to hear." It was demagoguery in reverse. As the candidate was searching for a voice that was sensitive and at the same time genuine, his ad hoc collection of aides was coalescing into a powerhouse of an organization. At its center was Gerard Doherty, the Massachusetts operative who’d parachuted in with an entourage of Vassar girls, Ivy League lawyers from K Street and Wall Street, and other "honorary Kennedys." Onto that unsteady base Team Kennedy grafted thousands of Hoosiers who had resisted joining Branigin’s army of professionals and McCarthy’s college corps. Money helped, too. In early April the campaign couldn’t afford a mimeograph machine; by early May it was commissioning opinion polls, TV ads, chartered planes with specially stocked galleys, sound trucks, and top-of-the-line hotels and rental cars charged to Papa Joe Kennedy’s credit cards. "It’s our money and we’re free to spend it any way we please," Kennedy matriarch Rose told the press. "If you have money, you spend it to win." Bobby spent the earliest hours of election day doing what he often did, grabbing dinner with staff and journalists at the nearest greasy spoon, in this case Sam’s Attic in Indianapolis. Boyish no more, he looked like the wreck he was after a grueling first primary battle—lines on his forehead deepened to crevasses, puffy eyes bloodshot and haunted rather than blue and hostile, and skin blotched like an older man’s. After a couple of hours’ sleep he relieved the stress of waiting by quarterbacking a football game on the front lawn of his Holiday Inn, playing tough enough that an aide twisted his ankle and a journalist was sidelined with a bloody nose. By nightfall Gene McCarthy’s nose would be bloodied, too, with Bobby scoring a bigger victory than anyone in his camp had hoped at the start. He took 42.3 percent of the vote – compared with Branigin’s 30.7 and McCarthy’s 27 – and won nine of eleven congressional districts along with fifty-six of the state’s sixty-three delegates. Kennedy beat Branigin in his home county, city, and precinct; doubled McCarthy’s take among Catholics, laborers, and younger voters; and won every substantial municipality except the college towns of Bloomington and Evansville. In black districts, he scored a crushing 85 percent of the votes. He also carried the seven largest counties in Indiana where Wallace, the racial-backlash candidate from Alabama, had done best in 1964. Bobby did less well in white precincts of Gary and in upper-income suburbs and small towns, where his opponents benefited from Republican crossovers. Watching the televised results that night from his headquarters at the Sheraton-Lincoln Hotel, Kennedy heard McCarthy say that who came in first, second, or third wasn’t what counted. Really? "That’s not what my father told me," Bobby said, laughing as he talked back to the TV set. "I always thought it was better to win. I learned that when I was about two." But he also offered a sober reading of the voters’ verdict: "I really have a chance now, just a chance, to organize a new coalition of Negroes, and working-class white people, against the union and party Establishments."